This has been an amazing summer for good weather, and on one of those sunny, calm days we left Wrangell in the boat and headed west. Looking back at Wrangell with a cruise ship in port. The Alaska Marine Highways ferry Taku was headed in to Wrangell to join the cruise ship in front of town. We continued out Sumner Strait. The ferry Taku headed for Wrangell. Just for a good excuse to get out of town and go play, we had two relatives from the midwest on board. They flew in to Wrangell on Alaska Airlines and then we ran around town to get their fishing licenses and some groceries. After that we whisked them out of town on the boat. Actually we cruised out of town at eight knots, which is about ten miles per hour, which probably doesn't qualify as whisking, does it? Once they were trapped on board we merrily put them to work on wheel watch and lookout. They didn't seem too broken up about the duties. They were here for vacation, and wanted to do a little fishing while in the area. We hadn't been out fishing for two years, so we rounded up some fishing gear and bait. Not being sure if we have all the right gear, or if it works, just kind of adds to the adventure. We poked our nose into St. John's Harbor along the way, but the dock was full, so we continued on to Point Baker. That little touch of fate put us in the right place. About six hours out of Wrangell a DeHavilland Beaver floatplane circled overhead and then landed in a narrow entrance ahead of the boat. We turned, and followed the plane into Point Baker. By the time we idled in there, the Beaver was unloaded and the pilot was taking off again. Two women were handling the mail and freight from Ketchikan. You can see them on the airplane float in the photo below. The dock at Point Baker. This service is a lifeline for Point Baker, a tiny community that has no roads at all. The Beaver is a great aircraft - a real workhorse. With the boat tied to the dock we took the skiff (the Faithful Steed) out fishing. The first day was shakedown day, bringing in a broken fishing pole, a reel with a buggered-up nest of fishing line, and enough salmon for smiles all around. Hey, what is a great fishing trip without having to improvise? We put stuff back together and plunked our seat-sore butts back into the skiff the next day to try again. We were just getting into the groove when something hit that was heavy enough to silence the "Fish on!" holler. We pulled the other lines in and watched. And waited...and watched. Um, we were fishing for salmon, with salmon gear, prepared for netting salmon into the boat. This could present a little problem. Big halibut in small skiffs are dangerous, and we didn't have a halibut harpoon to spear it. After about a half hour of bringing the fish up, having it run down, and repeating the process, we saw the mottled brown flatfish come up. It was a fair sized fish. Bring it around, gaff it, and pull it in. ...and the gaff glanced off! The fish was still hooked, and the blow from the gaff slowed it down. He brought it back up, and then it was gaffed and pulled aboard. Which splashed the camera lens and made subsequent photos blurry. Blurrier. Bad. Silver (coho) salmon and pink (humpy) salmon. The closest silver salmon weighed 13 pounds (6 kg) after it was cleaned. This halibut was 52 inches (132 cm) long which makes it 68 pounds (31 kg). We had halibut for dinner. Yum! Burp. Salmon fillet(s), Italian salad dressing, brown sugar, honey (optional), butter, olive oil. Put a little butter and olive oil in a pan on medium to medium-high. Put the fillets in, skin side down. Sprinkle the fillets with Italian salad dressing, brown sugar, honey, and add a few pats of butter. Cook about 3 to 6 minutes (cooking time depends on the thickness of the fillet). When the thin belly portion starts to turn light pink, turn the whole fillet over using two spatulas. Cook another 2 to 4 minutes or so, depending on the thickness. Turn the fillets back over. Use a fork to check if the meat flakes apart. Cook a little longer, if needed, until the meat flakes. Serve immediately. The next day, while you are wishing that you had made more, pull the pin bones out of the leftovers, remove skin, flake the meat into a bowl, and add mayonnaise and sweet relish to taste. Spread on bread or eat with crackers or slap hands as they dip straight into it with a spoon. I don't have pretty food pictures for you, just raw goods photos. The fish above? I filleted them. Aren't the silver salmon fillets pretty? Yummy, too. 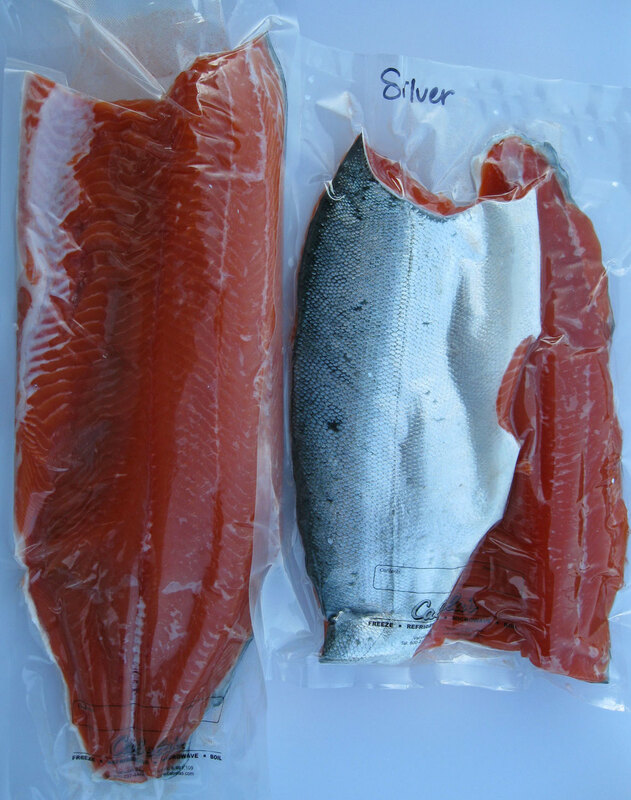 Silver salmon fillets vacuum packed for freezing. Hubby and guests worked together to vacuum pack and freeze the fish. Vacuum packaging keeps air away from the food, reducing freezer burn. Our relatives took some fish home, and we tucked some into our freezer for winter. Security in Alaska includes a full freezer. We had lots more fun around Point Baker, including viewing marine wildlife, visiting Memorial Beach, and walking around Port Protection. I will post about that soon! The Point Baker page shows you a little bit about the community and surroundings. Seals, Sea Otters, and...an Eagle?